Most estimators in scikit-learn are designed to work with NumPy arrays or scipy sparse matricies. These data structures must fit in the RAM on a single machine. Estimators implemented in Dask-ML work well with Dask Arrays and DataFrames. This can be much larger than a single machine’s RAM. They can be distributed in memory on a cluster of machines. In this example, we’ll use dask_ml.datasets.make_blobs to generate some random dask arrays. We’ll use the k-means implemented in Dask-ML to cluster the points. It uses the k-means|| (read: “k-means parallel”) initialization algorithm, which scales better than k-means++. All of the computation, both during and after initialization, can be done in parallel. 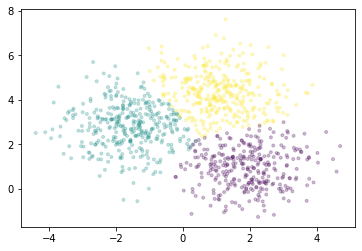 We’ll plot a sample of points, colored by the cluster each falls into. For all the estimators implemented in Dask-ML, see the API documentation.